Becoming an emergency medical technician (EMT) or paramedic is a rewarding but challenging career in the medical field. EMTs and paramedics play a vital role in the health and welfare of their local community. Both of these professions provide emergency care to sick and injured patients requiring immediate care. Training to become an EMT or paramedic takes anywhere between six months and four years. If an EMT wishes to advance further in their training, they will then move on to more advanced paramedic training. EMTs save lives and intervene during crises to take care of sick and injured people. When an ambulance is called, EMTs and/or paramedics are often the first to arrive on scene. From aiding an elderly person suffering from a heart attack to administering first aid at a crime scene, EMTs have to be prepared for any emergency situation. EMTs work in hospitals, clinics, and emergency rooms, and often arrive to trauma scenes in an ambulance. Tasks can range from administering life-saving first aid to assisting in childbirth to performing CPR. The mean average salary for an EMT or paramedic is approximately $31,980. The average hourly rate is $15.38. Paramedics, on average, will earn more than EMTs due to having a higher degree of training and expertise. Some EMTs work on a volunteer basis with a local volunteer ambulance association. Volunteer EMTs may earn a tax abatement on their local property taxes in exchange for their services. EMTs and paramedics with more experience and training will generally be paid at a higher rate. Paramedic firefighters typically receive the highest rates of pay. Private ambulance services pay out higher wages than hospitals and governmental entities. Unionized EMT and paramedic workers enjoy wage security under a negotiated contract. EMTs and paramedics need to complete a different course of education and training. These requirements differ from state to state and employer to employer. Check with your state’s specific certification and/or licensing rules to see what is required. Typically, you will need to have a high school diploma or GED in order to move forward. It is also helpful to hold your CPR certificate. You should be able to lift over 100 pounds if you would like to be an EMT. In order to enroll in courses, you may need to pass both a drug test and a background test. You will need to be up-to-date on your immunizations, including the full Hepatitis C series. Regardless of your ultimate goal, your first step is to complete basic EMT training. Basic EMTs need to complete about 120-150 hours of training, usually done over a period of six months to three years. These courses are often given periodically through emergency departments such as municipal fire, police, or health departments. However, if you plan to continue your training to become a paramedic, it is easier to enroll somewhere that will provide you with the full course of training. Training programs are also available on the internet, but lack the hands on element of training. However, online training programs offer a more flexible schedule to learn when you have time. At the end of training, basic EMTs will be able to: assess patients, complete physical exams, administer CPR, provide oxygen, clear airways, treat asthma attacks and allergic reactions, perform semi-automatic defibrillation, and provide glucose to diabetics. Basic EMTs will conclude their training with acquiring a Basic EMT Certification, or EMT-B. Intermediate or advanced EMTs may undergo up to 300 hours of training. Intermediate or advanced EMTs will learn about life support and the administration of oral and IV medications. Intermediate or advanced EMT programs lead the student through more advanced techniques, equipment and medications used to provide life saving therapy. This also includes spinal injury and burn management during more severe trauma cases. Be sure the program you choose will help you pass the NRAEMT exam, which is required by most states. Passing the NRAEMT exam will provide you with certification from the National Registry of Emergency Medical Technicians. If you would like to continue training in this field, you can continue your education to become a fully licensed paramedic. Paramedics generally complete over 1,000 of training and often acquire an associate’s or bachelor’s degree in paramedic studies. Paramedics will already be proficient in the tasks of EMTs, but must also provide treatments that require the breaking of skin such as: administering IVs, intubation, suturing, and cardiac interpretation. Paramedics complete clinical rotations in medical clinics and hospitals as part of their training. State law may require EMTs and paramedics to attend continuing education classes to keep their license and certification current. EMTs and paramedics must re-register with the National Registry of Emergency Medical Technicians every two years to maintain their NRMET certificate. The bare minimum education needed before embarking on a career as an EMT is a high school diploma or GED. EMTs and paramedic students who already have a good foundation in math and science will have a good head start. While not required, advanced paramedic students may wish to obtain an associate’s or bachelor’s degree. A degree will provide them with a better chance for higher pay and increased job opportunities. Coursework will provide additional training and education in anatomy and physiology, among other important areas in the medical field. EMTs and paramedics holding a degree can pursue a career as a healthcare administrators, EMT or paramedic training managers, or clinical supervisors. Any additional education will help perform better on the job and provide patients with the very best care possible. When seeking education in this field, students should make sure their school is accredited by the Commission on Accreditation of Allied Health Education Programs. Students should also ensure their schools have state-of-the-art equipment so they can be trained on the most up to date technology so they will know how to use it in the field. Most college programs will provide both classroom training and hands on training in the field with “real life” situations. Experienced faculty members are key to getting a good education. Do your research and analyze what training opportunities your school provides, the size of the classes, and licensure pass rate. It would also be a good idea to check any prospective school’s employment rate. Before applying, make sure that you will be able to meet any admission requirements. If needed, look into any financial aid programs offered. Check to see the education requirements of your state and the salary increase you can expect with a college degree. Being an EMT or paramedic is a challenging job, so being prepared for every situation is what will help provide the best outcome. The more education and training you acquire, the better you can perform and help save lives. Training programs for EMTs and paramedics are not only essential for employment, but to be fully prepared on the job. Certification programs start with more basic training and move into more advanced techniques for helping patients heal after trauma, accidents and illness. All states require EMTs to be licensed. Some states also require certification. Some states require their own state-administered exam. Some employers require both certification and licensing even when it is not required by the state. Most states require the passage of the NREMT exam. Licensing and certification testing often involves both written questions and practical portions of the exam. Most states require individuals to be 18 years old in order to take exams to be licensed or certified as an EMT. You may also be required to take a background check and/or drug test. Check with your state for the most up-to-date requirements. 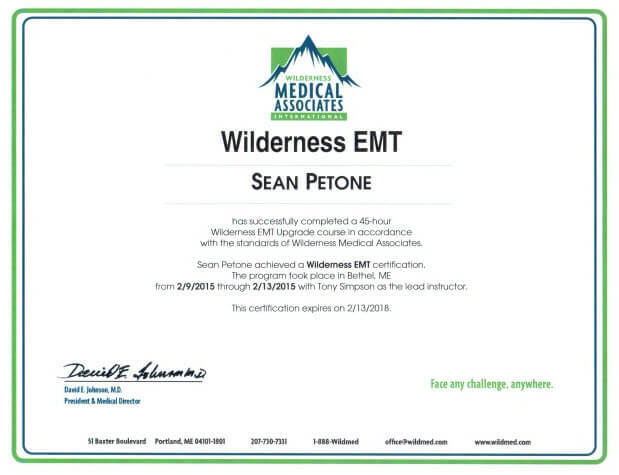 EMT-1 or EMT-Basic Certification: Certifies that you are capable of providing basic care to sick and injured patients. Basic EMT courses take about six months to complete. EMT-11 and EMT 111 Certifications: Provides more advanced training to administer IV fluids and medications, operate advanced airway devices, and use manual defibrillators. NREMT Certification: Required by most states for individuals wanting to work or volunteer as an EMT or paramedic. Paramedics will complete approximately 1,200 to 1,500 hours of training, which includes all of the requisite training for EMTs. Paramedics will generally spend on average two years to complete their training. Advanced programs will include thorough, rigorous coursework that prepares students to act quickly and accurately in a crisis. In addition to certification programs, some students may choose to pursue additional training through a college degree program. Be aware that hidden costs for supplies and equipment will increase the necessary investment in becoming an EMT. EMTs and paramedics are jobs that are always needed in every community. Paramedic firefighters are the most employable, due to their highly specialized training. The rapidly increasing aging population in the United States ensures all jobs in the health care field to remain in high demand. The overall increase in population further guarantees the need for these services. Salaries for EMTs and paramedics are commensurate with experience, but are generally not on the high end of the wage spectrum. However, working as an EMT or paramedic is a rewarding, satisfying career that contributes greatly to society. After receiving the requisite licenses and/or certifications, EMTs and paramedics may pursue similar jobs in the medical field such as: healthcare administrators, EMT or paramedic training managers, or clinical supervisors. That's a higher than average projected growth of 37,400 jobs. Should You Become an EMT/Paramedic? EMTs and paramedics have a very high rate of satisfaction in their jobs knowing that their efforts help save lives. Additionally, those who receive their services are extremely appreciative that there was someone there to help save their own lives or the lives of their loved ones. Some communities have volunteer ambulance services, which means that their municipal EMTs do their work on a volunteer basis just to serve their local community. EMTs and paramedics can also feel satisfied knowing they helped other emergency personnel, such as police officer and firefighters, do their jobs successfully. The average wage for EMTs and paramedics will depend on region, training, type of employer, and other factors. Paramedic firefighters receive the highest average wages, while basic EMTs will receive the lowest. Paramedics earn slightly higher wages than EMTs. The median annual salary for these jobs is approximately $31,700. Paramedics on the higher end of the scale will earn closer to $55,000. EMTs on the lower end of the scale will earn around $20,860. Some EMTs work on a volunteer basis, with the possibility of receiving only a property tax abatement for their contribution to their community. Currently, there are about 250,000 jobs for EMTs and paramedics in the United States. Recent studies have concluded that the growth rate for EMTs and paramedics should be about 23-24% over the next few years. This rate is higher than the growth rates of other occupations. The increase in the elderly population is a contributing factor to this high rate of growth. The state of Virginia is currently experiencing the highest growth rate for EMTs and paramedics, followed by Kentucky and Utah. Depending on their goals and capabilities, EMTs and paramedics can complete their training from anywhere between six months and three years. Very basic training can take as little as a few weeks. Committed paramedics may seek an associate’s or bachelor’s degrees, which can take upwards of four years to complete. The more education and training acquired, the more prepared you will be for crisis situations that will be faced every day on the job. Higher education will generally help you find a higher paying job. EMTs and paramedics are often the first individuals on the scene at a crisis, and are essential personnel to help saves the lives of others in danger. Q. How long is the training to be a paramedic? 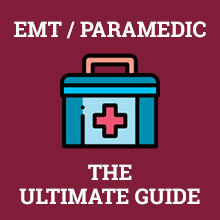 Paramedics need to be proficient in all of the duties of an EMT, but will advance to learning far more advanced life-saving techniques. Individuals who are seeking to become a paramedic can opt to choose to take a certification program or obtain an associate’s or bachelor’s degree. On average, programs to become a paramedic generally take about one to three years. Q. What qualifications do you need to become a paramedic? The specific qualifications for becoming a licensed or certified paramedic will vary from state to state. Check with your state’s current guidelines. Those seeking to become a paramedic must first obtain a high school diploma or GED. Next, aspiring paramedics must become a licensed EMT. Students may opt to enter into a college program or simply complete a certification program to become a paramedic. Most states require paramedics to pass the NREMT exam. Q. What is the difference between a paramedic and an EMT? EMTs require much more basic training than a paramedic. EMTs generally do not perform procedures that break the skin, whereas paramedics are required to be proficient in these types of procedures. Paramedics are far more qualified for treating patients in a wide variety of situations. One can become a basic EMT in as little as a few weeks. The training to become a paramedic is generally around 1,200 – 1,500 hours. Q. How much do paramedics make in a year? Paramedics generally make higher wages than EMTs, but the differential is not significant. The median wage for paramedics is about $33,380. The region of the country, amount of training, employer, and type of work will cause the salary to go up or down. Highly specialized jobs such as licensed flight paramedics, critical care paramedics, and tactical paramedics can command higher rates of pay. Q. How many hours does a paramedic work in a week? Paramedics generally work a 40 hour work week, but due to the nature of their jobs they may work overtime. The number of hours worked each week will depend on their employer and the nature of their work. Paramedics may need to work shifts that fall anytime during the day, including weekends and holidays. Paramedics may be called in during off hours to assist with large trauma scenes. Q. How much does it cost to become an EMT? Basic training to become an EMT varies widely. Community college EMT programs can cost as little as $200, and technical school training can cost over $1,800. Students may also incur costs for supplies, materials and equipment. The cost for exams, such as the NREMT exam, will cost around $70. Licensing, certification, and training costs will vary from state to state.